Please accept my apologies for posting these photos here. I have a good reason, beyond ego. I need to make them accessible with a single URL click to a special audience, and I am not bright enough to host them properly on Facebook or other media. The photo above is of me with the First Couple at the Rose Garden on 7 November, 1983. 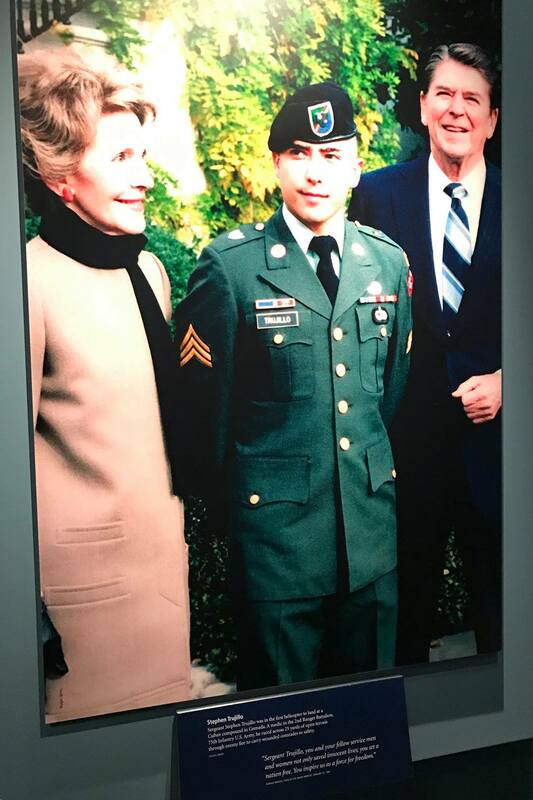 This photo was, or is, on display at the Reagan Library, and this photo of it was taken by my Ranger brother Jeff Mellinger. 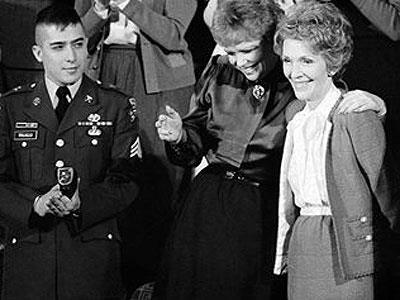 The photo above is of me with Mrs. Maureen Reagan and her mother First Lady Nancy Reagan at the State of the Union Address, January 1984. 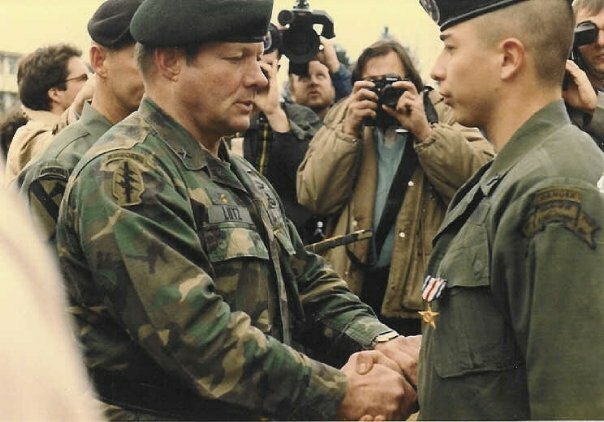 The photo above is of me receiving the Silver Star from BG Joe Lutz, who was the commander of 1st SOCOM at the time, at a formation of the 2d Ranger Battalion at Fort Lewis, Washington in April, 1984. This photo was taken by Randy Houseman. 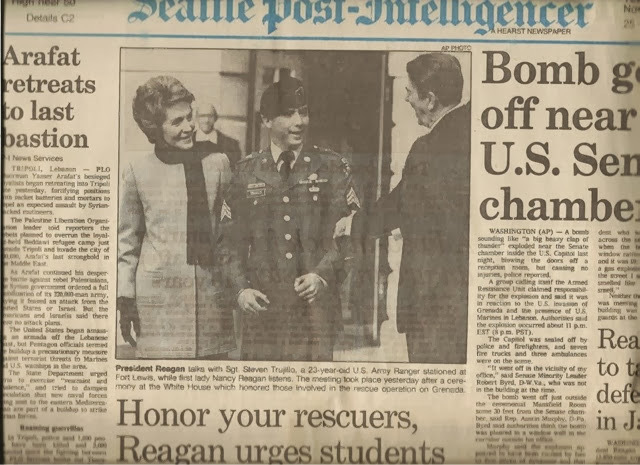 The above is the front page of the Seattle Post Intelligencer, November 8, 1983, featuring a photograph of me with President Reagan at the Rose Garden ceremony for rescued students from Grenada. I was on the front page of newspapers across America, though I was bumped off some because a Puerto Rican separatist group chose that same day to detonate a small bomb at the US Capitol. Again, please accept my apologies for posting these. I would not do it under normal conditions, but these are not normal times for me. ETA: Here are links to previews of my first book, A Tale of the Grenada Raiders, which were published in the Daily Beast and the Huffington Post. ETA: I added the photo of the Seattle Post Intelligencer on 12 April 2017. ETA: I edited this page on 15 February, 2018, correcting grammatical errors and changing the name of A Tale of the Grenada Raiders.